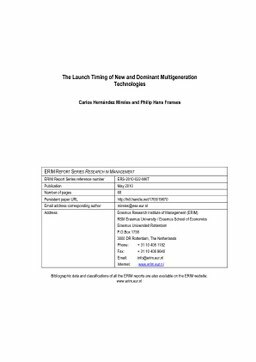 In this paper we introduce a model that is suitable to study the diffusion of new and dominant multi-generation technologies. Examples are computer operat- ing systems, mobile phone standards, video game consoles. Our model incorporates three new features that are not included in related models. First, we add the ability of a firm to transfer users of its old technologies to the new generations, what we call firms’ alpha. Second, we add competitive relations between market technolo- gies. Third, the launch strategies diagnosed by our model cover, as special cases, the now or never strategies and hence it is suitable to study intermediate launch strategies. We find that the appropriate timing of a new technology depends heavily on both the firms’ alphas and on the competitive positioning of their products. In addition, we argue that the strategic interaction of firms may lead to very different sales outcomes depending on the competitive positioning of their products. In the VGC case we find that the Nintendo Wii was launched at an appropriate moment while the Sony PS3 perhaps should have never been launched.